Given this thread was started back in 2011 I should have made this comment some time ago. Anyway the thread brings to mind Nortran [they were absorbed by Pace some years back]. They had a slogan "We go where you go and stop where you stop". Times bring about a change. Nortran used to go to Glenview Naval Air Station, which I guess proves your point. Another one you can add to the "probably next" list is 626. All new signs up, including in some unexpected locations (like on Lake Cook Road on the far side of Saunders Rd). BTW, one way to tell a new bus stop sign is that it has a slash between routes on multi-route stops instead of a dash, i.e. 234/272/626, not 234-272-626). I guess making 471 the next priority is coming, like that's really necessary. Prediction was correct. 471 is posted stops only, effective Aug.14. Latest notices are for 240, 318.and 571. 501 looks like it will soon be posted stops only. There are new bus stop signs all along the route including "W Trips Only" signs on the Shorewood branch. Prediction was correct: 501 Posted stops Effective December 18 (359, 530, and 561, too). About 7 months ahead of my time, but the Passenger Notice for 626 is posted. Also, the signs are posted on the new routing in Lincolnshire. 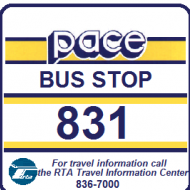 307 is next (Passenger Notice). Looks like 272 will be soon. New signs in the Lincolnshire area. Too far off the road to make them out completely, but the 12/2017 schedule has straight Milwaukee as C trips. Yep. New signed up and down Southwest Highway labeled as "C" trips. Looks like 272 will be soon. Passenger Notice; effective May 7. Also, Passenger Notice (already in effect). Throw in 803, while you are at it. Pretty soon, #311 will become Posted Stop Only. A month ago I tweeted at Pace suggesting this because I've talked to drivers who have said that there are occasions where if they depart North/Narragansett, they will arrive at 47th 45 mins late. Also, I have always found 311 unreliable so I'm glad they're taking this into action now. Since last week, Pace has been taking down old signs and posting new ones along Oak Park Ave. I can confirm a driver told me today that 311 will become Posted Stop Only. Everything eventually will be. What seems to be overkill is that school trips are also included, so there are signs near Maine East for 423/240 'C' Trips/250 'G' trips, and in this case, the 423 will be gone in about 8 months (in that 423 moves from Harlem to Waukegan). Looks like the #208 Golf will be next, starting March 3rd.